When we moved into our house I had some kind of “nailing stuff to the wall” phobia. 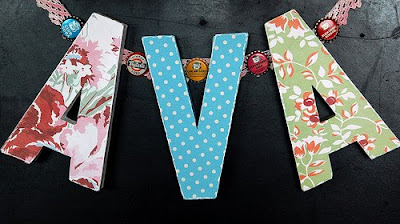 I decided I could use a little wall décor and knowing how much scrapbookers love letters, at least most of the ones I know do, I thought this might be a fun project to share. The paper mache letters came from Hobby Lobby. They’re regularly priced $2.47 a piece. I waited until they were half off and bought the entire alphabet and my daughter’s name. I chose several patterns of Jenni’s papers from various releases. I used cream mist on two of the letters to make the colors a little more muted, the navy and white floral (Trendy Floral) and the green and white Victorian (Victoria – Sitting Room). I laid them out in an order I thought would look nice. I then took the letters, in order, and painted the sides of the letters the same colors as the background color of the coordinating patterned paper making sure to paint a little onto the front of the letter around the edges. After the letters dried I traced the letters onto the back of the paper. You might need a window or a light box to make sure you have your letter placed exactly where you want it like if using a large scale floral paper. Then cut them out. It takes about one bottle of Zip Dry glue to do this. I took the lid off the Zip Dry and holding the bottle next to the letter upside down, I ran a line of glue down the letter. I quickly used a foam brush (because you’ll have to throw it away when done) and spread out the glue then placed the paper on the letter and smoothed it down. Next, I took an Exacto knife and cleaned up the excess paper edges. I used a sanding block and a Basic Grey file set to distress the edges. I considered using a few solid black letters. If you don’t have enough patterned paper you might consider that. The letters are lightweight and are hung on the wall using poster putty. From this angle you can see the sides of the letters are painted to match the papers. I love the way it turned out. It’s so cool to me that Jenni’s papers from the newest release along with some from her oldest releases all still look so current and fabulous together. So here’s the set I made for Ava’s room. I used a piece of vintage pillowcase edging trim, and after doing the above steps again, I glued the letters to the trim using bottle caps as spacers. I used Aleene’s Platinum Bond 7800 for that. I’m planning to do Zane’s teacher’s last name for teacher appreciation. So many of these wonderful items from past releases can be found in the JBS Mercantile shop. The Mercantile exclusive paper can also be purchased there. Check it out! And thanks for joining me with my Love of Letters Jenni Bowlin Studio projects! Really cute, love it Briana! At first, I thought it was a chalkboard wall and they were magnets! Love, love all of these patterns together. 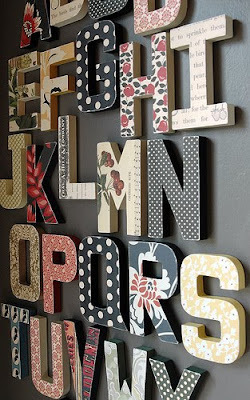 that is a great idea if you used smaller letters they could even spell words with them when they are beginner readers! These are so cute! I love this look! love these!!! such a great idea! Love this project! I think I have to make a HL run now! That is amazing. My mind is swirling with ideas...I'm thinking Halloween papers and a boo garland like thing (like the one you did for your daughter) awesome. Seriously. What a fabulous idea! Love how this turned out! So creative and fun! LOVE LOVE LOVE this idea! 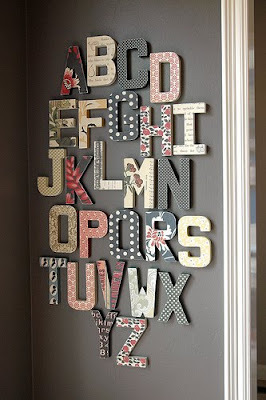 I'm so going to copy this idea, but I'm going to give the letters a double purpose by covering the backs in HALLOWEEN or CHRISTMAS paper (haven't decided which one) that way I can flip them over for the given holiday. Thanks for the idea! Wow they are looking great on the wall..My mind is swirling with ideas.....I really admire your idea and post also..
Did these letters yrs ago and am planning to make a new college friend's name for her new apartment for Christmas this yr. Like the way you mounted yours to the wall. That is super nice....I love the way it looks = ) Thank you for sharing how you made them ! What is the name of that grey paint color? @smashHi Smash. I am almost certain it's called Folkstone from Sherwin Williams. This is super cool. thanks for a great idea! Oh WOW!!! This is an amazing idea. I love it! Thank you so much for the inspiration and for sharing these pictures. Is my first visit to your blog but I will be back soon. What a cute project! Also, what color paint did you use on your walls? It's beautiful! I too want to know what is "jennie's papers"? Is it wall paper? It is Jenni Bowlin Studio scrapbook paper - this is the blog for Jenni Bowlin Studio products. Follow the link from the blog navigation bar that says "JBS Mercantile" which will take you to an online store selling Jenni Bowlin Studio paper. Can you useany scrapbook paper? 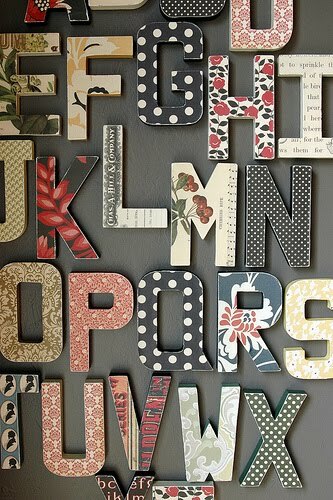 Where can I get some cool paper like this for my letters? These are great and we have plenty of poster putty! Now I just need to wait for the letters to go on sale at HL again... and to think I will get to use LOTs of the paper we have around here... I may even do this with our bedroom using copies of love letters from my husband while we were dating and he was deployed. Thank you for the inspiration!! That is a beautiful idea, Peggy! at the web the simplest thing to take note of. I had "Pinned" this awhile ago and forgot about it. I just was at Hobby Lobby today and saw the letters and thought that I could glue scrapbook paper to them (this must have been in the back of my mind somewhere). The only problem was I was not quite sure how to do it. Then later today Pinterest told me that someone repined this from me. It must be fate that it happened today. Thanks for leaving this blog post up! I’m curious what your running cost is for this project? Have you been keeping a track? I did this for my granddaughters but I covered the entire letter with scrapbook paper. Somewhat tricky on some letters. They loved them! Where do you buy zip dry glue? Where did you buy the paper...? Custom published Decorative Alphabet Letters will make an excellent souvenir for students leaving college. Would Mod Podge work just as well? hi there, love this. can I use card to cover the letters or does it work well with paper only? How did the Mod Podge turn out? Welcome to the JBS Team Waleska Neris! Welcome to the JBS Team Megan Klauer! September Gallery Updates - One of Two! The September Gallery is Live!